Learning a second language gives you the chance of seeing the world in a totally different way. Doors open to new opportunities in many areas of your life, and your mind sharps and opens to new experiences and cultural encounters. Learning Spanish is a new trend, 400 million of native speakers in 30 countries around the world are one of the most important reasons why you should learn it. But, then it comes the questions: Where? And Why? Come on… a school in front of the beach?! Wow! When you read the word “school” you can imagine anything but “fun”. Well, hold on, because Perfect Sunset School is located in the beautiful Playa Hermosa from Santa Teresa Beach, Puntarenas Costa Rica. You´re gonna learn Spanish with the sound of waves gently lapping on the shore. 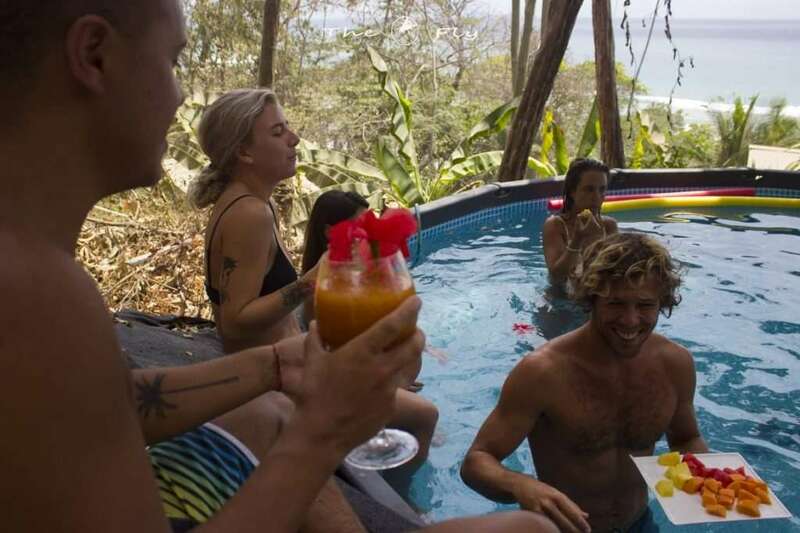 Besides, you´ll learn everything regarding the language with plenty of time to spare for surfing, relaxing on the beach, and exploring Costa Rica. We count with an interactive method that combines the communication process with structured grammar integrated into the communication itself. You´ll be involved in the language since the beginning but, with appropriated guidance. We take into account the Europe Common Framework of Reference for Languages, we teach in a practical and enjoyable way through different types of activities, becoming proficient at the 4 skills of language: Reading, Listening, Speaking and Writing. 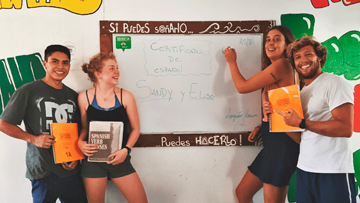 In our Spanish School you have not only master classes, but the opportunity to be part of the local community and the possibility to interact with them getting involved in the language every day. People in Costa Rica are Pura Vida and they enjoy helping you to sharp your oral skills. Selecting the best teachers is a must in our school, that´s why they are carefully evaluated according to their academic certificates, experience, competence and professionalism. 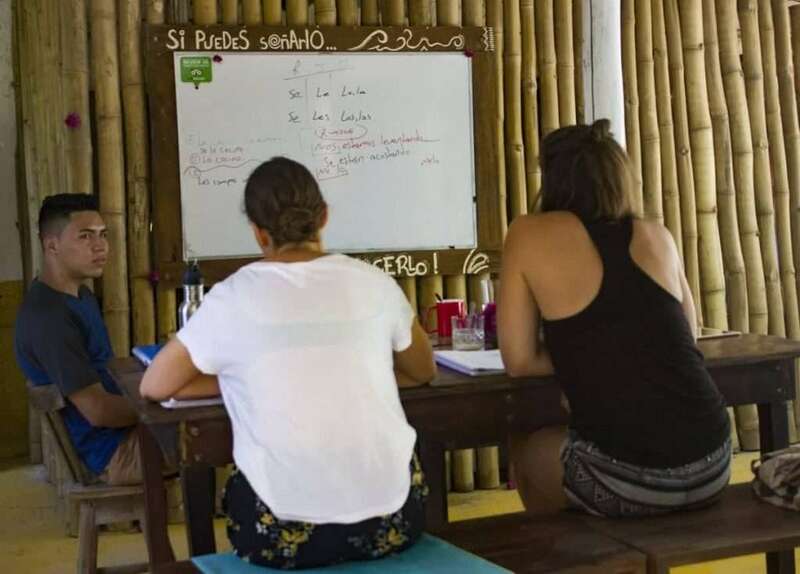 They are graduated from university and they regularly participate in practical trainings on the art of teaching Spanish as a Foreign Language and the newest teaching methods. They are enthusiastic, patient and they will help you to establish clear learning goals encouraging you to participate in Spanish from the very first day. We´ll help you to get a flawless Spanish from any level, since beginners up to advanced students in order to satisfy your communication needs from the basics of language up to the most complex structures, using the best techniques to teach grammar and always looking forward your enjoyment while learning. “The less is more”, that´s why our groups include no more than 4 participants. That´s why you get student – centered learning and personalized lessons. What are you waiting for contact us and schedule your classes?